We do this outdoor flag ceremony at events like baseball games where we walk the flags onto the field. Have min of 3 scouts with 5 best practice a couple of weekends before actual event day to be the Colorguards for this ceremony. Wolf Rank needs an outdoor flag ceremony to rank so pick them first. Line up all scouts at one practice start point and walk them all out to another stop point. Get the scouts use to holding the heavy flags straight up vertically as they walk. Switch out any boys that can’t handle walking out the heavy flags. US flag in the middle, State flag right, Pack flag left and scouts on outside. Scouts walk forward in fan shoulder to shoulders formation not bunch up. The middle scout holding the US flag will set an even slow walking pace and all the other scouts in formation will watch the middle US flag bearer and keep his pace!!! All flags held high in the vertical position NEVER letting any flags touch the ground! Scouts will walk out onto the field; pivot and walk back per the callouts in the attached document below. We do these flag retirement ceremony at our annual two campouts. Quartermaster to collect the flags monthly from our Pack 533 Flag Retirement Donation box at the HEB at the front of our Fairfield neighborhood. 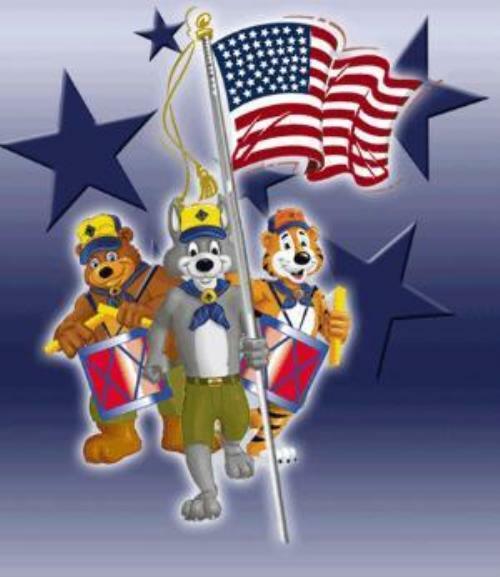 Cubmaster, download the document "PACK 533 – American Flag Retirement Ceremony.doc" below in the attachment area of this webpage and bring to campouts. Cubmasters to get a fire going and have bucket of water by fire per Scouting requirement Cubmaster to select the top three Scouts that sold the most for Popcorn, Scout Coupon Book and any other fundraiser in our Pack as to have the honor of being Colorguard for this ceremony Cubmaster to practice with the 3 Scout at campout before flag retirement ceremony. The Flag Code, which formalizes and unifies the traditional ways in which we give respect to the flag, also contains specific instructions on how the flag is not to be used. The flag should not be used as a drapery, or for covering, a speakers desk, draping a platform, or for any decoration in general. Bunting of blue, white and red stripes is available for these purposes. The blue stripe of the bunting should be on the top. The flag should be cleaned and mended when necessary. When a flag is so worn it is no longer fit to serve as a symbol of our country, it should be destroyed by burning in a dignified manner. The other flags may be smaller but none may be larger. The flag should be raised briskly and lowered slowly and ceremoniously. Ordinarily, it should be displayed only between sunrise and sunset. It should be illuminated if displayed at night. To salute, all persons come to attention. Those in uniform give the appropriate formal salute. Citizens not in uniform salute by placing their right hand over the heart and men with head cover should remove it and hold it to left shoulder, hand over the heart. To place the flag at half staff, hoist it to the peak for an instant and lower it to a position half way between the top and bottom of the staff. The flag is to be raised again to the peak for a moment before it is lowered. On Memorial Day, the flag is displayed at half staff until noon and at full staff from noon to sunset.